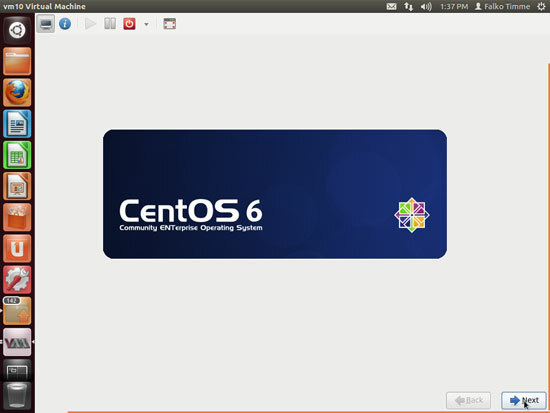 The KVM guest will now boot from the CentOS 6.3 DVD and start the graphical CentOS installer - that's why we need to connect to the graphical console of the guest. 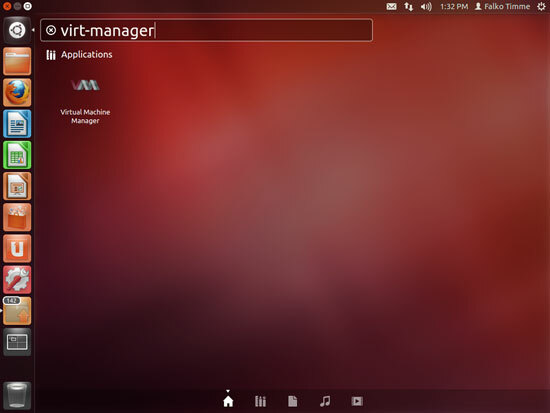 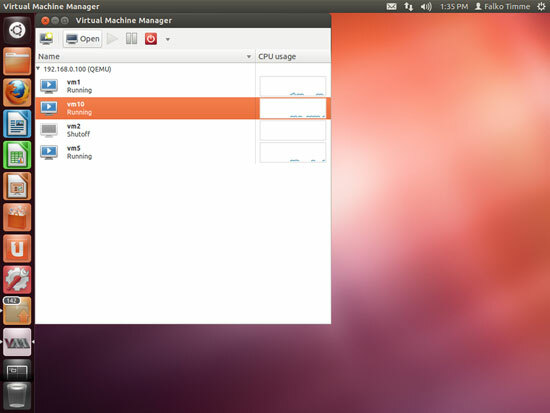 You can do this with virt-manager on the Ubuntu 12.10 desktop (see KVM Guest Management With Virt-Manager On Ubuntu 8.10). When you start virt-manager for the first time and no KVM is installed on your Ubuntu desktop (i.e., the KVM host is not identical to your dekstop), you will most likely see the following message (Could not detect a default hypervisor.). 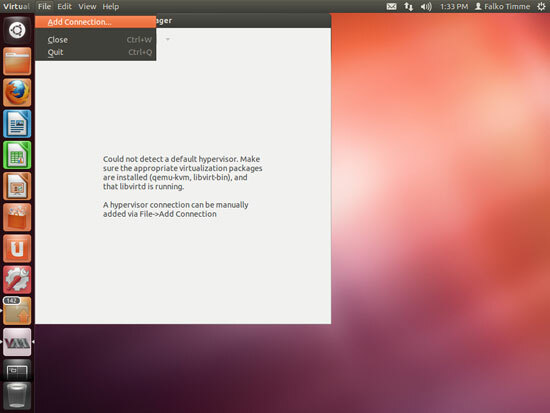 You can ignore this because we don't want to connect to the local libvirt daemon, but to the one on our remote Ubuntu 12.10 KVM host. 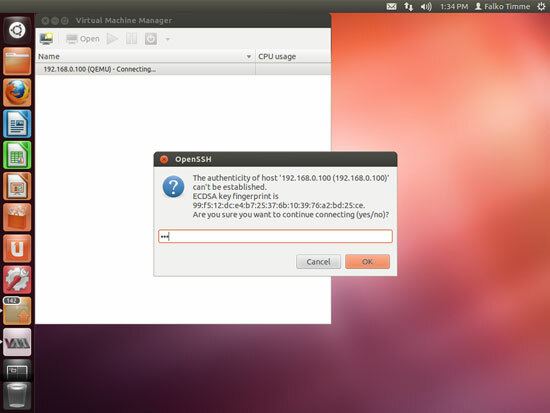 Select QEMU/KVM as Hypervisor. 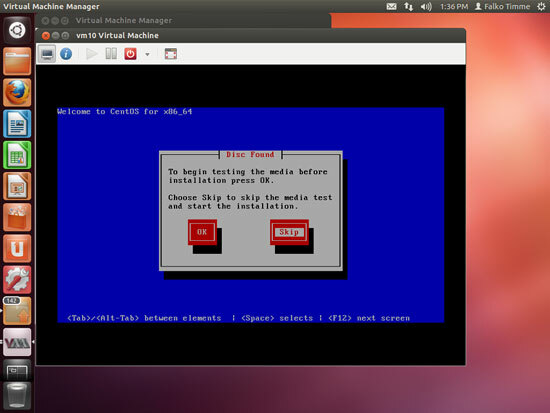 If the KVM host is identical to your desktop, you are done now and can click on Connect. 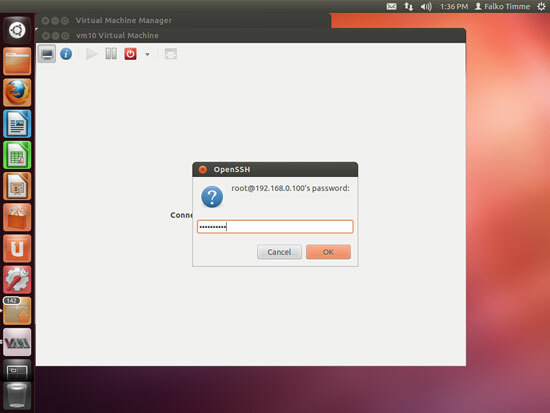 But if the KVM host is on a remote Ubuntu 12.10 server, then check Connect to remote host, select SSH from the Method drop-down menu, fill in root in the Username field, type in the hostname or IP address (192.168.0.100) of the Ubuntu 12.10 KVM host in the Hostname field, and click on Connect. 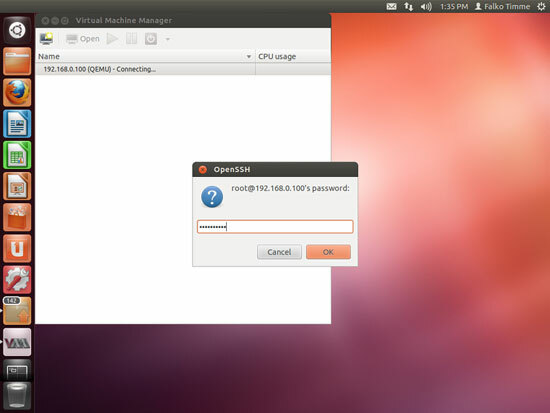 Afterwards, you can connect to the guest again with virt-manager and configure the guest. You can as well connect to it with an SSH client (such as PuTTY).